You must make reservations at least 5 minutes in advance of the time at Fraschetta. The parking lots in the rear as well as side of the restaurants offers free parking after 5:00pm. Bryn Mawr Train station as well as the 100 line are nearby. Fraschetta can also provide off site catering for special events. 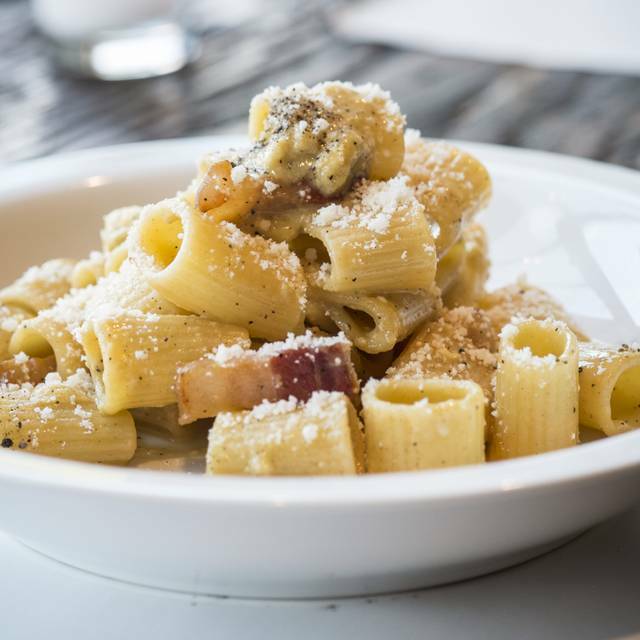 Fraschetta is located in the heart of Bryn Mawr. It is recognized as a 3 bell restaurant by the Philadelphia Inquirer. Roman born Chef Gianluca Demontis creates traditional and contemporary Roman dishes. He has the ability to transform simple dishes into something tasteful and elevated. We use only fresh, seasonal ingredients, and the menu offers a variety of seafood, meats, housemade pastas as well as vegetarian and gluten-free dishes. We love the food. Since we are pescatarians a few additional fish selections would be great. My only complaint with the restaurant is the noise level. The second floor level is quieter but not as interesting in terms of ambiance. They did appear to make a feeble attempt at noise dampening by adding a few baffles on the ceiling but more could be done to both the ceiling and the walls without losing any aesthetic appeal. Other than my few complaints we really enjoy having dinner there every few months. We enjoyed lovely dinner after a movie at Bryn Mawr Film Institute. We had an excellent meal with a perfect friendly service. All good!! Consistently yummy. Lots to choose from. Can get noisy but Sunday night was a quieter crowd so it was delightful for a gno. Excellent service! Creative and delicious food. Like that it’s BYOB. Definitely returning. This restaurant was one of our favorites. Our most recent visit was a disappointment. The food was not as good -- we each had a different fish dish and both were fishy and, while not bad enough to complain or send it back, did not rise to the level we've been accustomed to at this restaurant. The service was friendly enough, but seemed inexperienced and out of synch. Our reservation was early (5:30) and the place was already noisy, and got progressively more so as more people arrived. I hope this was an aberration, but am not particularly eager to try it again soon. Such a cute place! Food was very good from apps to dessert! Will be going again! Great place to go for good food and a great experience. The service is always outstanding and we always have a great time. Highly recommend!! Third time eating dinner here. Great food, great service every time. Great food presented beautifully, with personal service. Only knock is that it gets noisy easily. The service was good. The food was ok. The meatballs had to be from a pre frozen bag. The mash potatoes I’m guessing instant. Maybe they were grits being passed off as potatoes. The pork came out a little over cooked. My pasta dish was labeled spicy. It wasn’t, at all. I wouldn’t recommend this place to anyone. Lovely, small clean & intimate, a well run local foodie place. Great olive oil, salads menu (my fave beet). Nightly upscale pasta addition as a special-stinging nettle with gnocchi offered that night & a Barramundi grilled fish with fancy everything in their sauce topping creation. The are accommodating ie will switch the pasta shapes and sauces around. Always good. Consistently good food. Great staff. One of my favorites. Please go to frashetta! It is the best Italian on the main line! Perfect for dinner and a movie next door afterwards! I love the fennel, radicchio and orange salad and pasta dishes. Main courses and desserts are sure to satisfy any appetite. 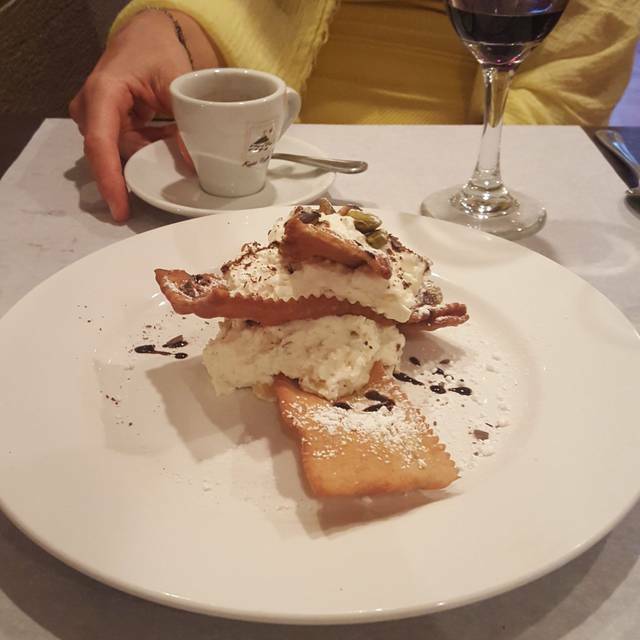 We love to eat at Fraschetta before going to the movie next door at the Bryn Mawr Film Club. chocolate cake, ice cream. No popcorn for us. What a pleasant surprise- fabulous food, great service and BYOB! We'll be back soon with friends! The pasta with shrimp was delicious! Can’t wait to go back and have it again! I love your restaurant. We were there on a rainy night and it was cozy and quiet inside. The service was very attentive, but not intrusive. The food was delicious. A lovely evening. Great experience, great service ! One of our favorites!! Highly recommend! Excellent in every way, except tables too close for comfort. The fennel salad was fresh with just the right combination of flavors. Pappardelle with Oxtail ragù was prepared perfectly and tasted delightful. No room for dessert this time. It was good as usual. Excellent food. Responsive to our need to be next for for a movie in an hour. Great food and excellent service! Will definitely return! Had options not on the menu for the kids as well. Food here is solid. We had dinner here on the Saturday after Valentine's Day; had been here about 4 weeks earlier on a Saturday night. Were actually seated at the same table! Experiences were pretty similar; the menu is easy to navigate and Joe is quite adept at describing the specials. We had the strawberry salad, calamari appetizer (not breaded), split an eggplant pasta course. My wife had the dorato fish special which looked pretty good, a little dull in its presentation with a polenta. A lot of white on white on the plate. I had a duck leg entrée that was a little tough; sauce was kinda sweet but I assumed it had been prepared properly - just not so exciting. The house gelatos vanilla, choc, strawberry were very good. Similar to my last visit, a couple of service issues; they seem to fire the courses late so somewhat long breaks between courses. Also, the woman server doesn't always know if Joe has taken the dessert order so I got my check before dessert arrived. they wound up comping us the desserts. they are very nice to their patrons and seem interested in your coming back. It's a decent neighborhood place. Need to up their game a little. The Hostess (sorry I don't remember her name) is gracious and guided us to our table. Our waitstaff person was extremely helpful in describing the 'specials' and allowed us sufficient time to decide what we wanted to eat. Even though the tables are close, there were fine acoustics so that we did not have to yell to be understood. Wonderful food and great portions. I had 1/3 of my lasagna boxed and ate it the next day. When heated, it was as delicious as it was the previous evening. Fraschetta is our 'go to' restaurant in Bryn Mawr. We dine at Fraschetta about once every other month, and it's always an enjoyable experience. The food is great, and the servers are reliably terrific. This past Saturday was busier than we've ever seen it, but the service never faltered, and the food was up to its usual high standards. I especially liked the salad special, which was watercress with strawberries and goat cheese. This time, I want to give a special shout-out to Anne. She wanted to put us upstairs, but two of us have had knee replacements and find going up and down Fraschetta's stairs problematic. She managed to rework the seating arrangements so that we could be seated downstairs. Thanks so much, Anne! Great V Dsy dinner. We will certainly be back! Terrific restaurant but please get some Tabasco! Unprofessional service. Forgot to clear plates when the next course arrived. Confused with who ordered what. Servers hung at the bar ignoring customers. We have been here many times and will be back again. The food always is very good. We especially like the "frito misto" appetizer, though now one gets shrimp rather than those tiny fish (sardines? anchovies?) that we loved so much. Had duck, something new on the menu, and it was really good. The waiter, Steve, and his colleagues were helpful, polite, and not intrusive. In short, this is a place well worth visiting -- often.